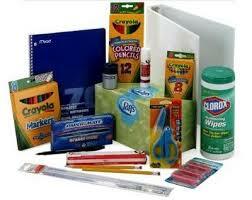 For your convenience, Park Campus PTO is selling pre-packaged school supplies for the 2014-2015 school year. We do the shopping and you enjoy your summer! We will have them ready for you in August when you child comes back to school. Please order online or return the order form below with your payment to the main office no later than Friday, June 27, 2014. Checks can be made payable to "Park Campus PTO". If you are ordering more than one school supply pack, or would like to add scented pencils or Spiritwear to your order, simply click on "Continue Shopping" after you add the first item to your cart. Be sure to select the grade your child will be in next school year! Please Note: The supply packs do not include the following: backpacks, calculators, dictionaries, gym shoes, book covers, socks (for use as a white board eraser), or items that may be added after June 27. The scent is embedded in the topper to create a yummy aroma! Each scented topper comes with a decorative pencil and eraser. The topper can also be used to protect the pencil point. Available in 5 delicious scents!